Tales of the Trailcam - three of the Big Five, including a big cat! The first day the Trailcam was up at a wallow filled up by the recent rains. It was a busy place with lots of general game coming past like impalas, zebras and a giraffe. The last one was very nice to see. At night a few hyenas walked past. That first night, lions killed an abandoned buffalo calf right by the camp! Steven’s guests were awake half the night listening to the sound of the lions feeding and then the hyenas squabbling over the remains. 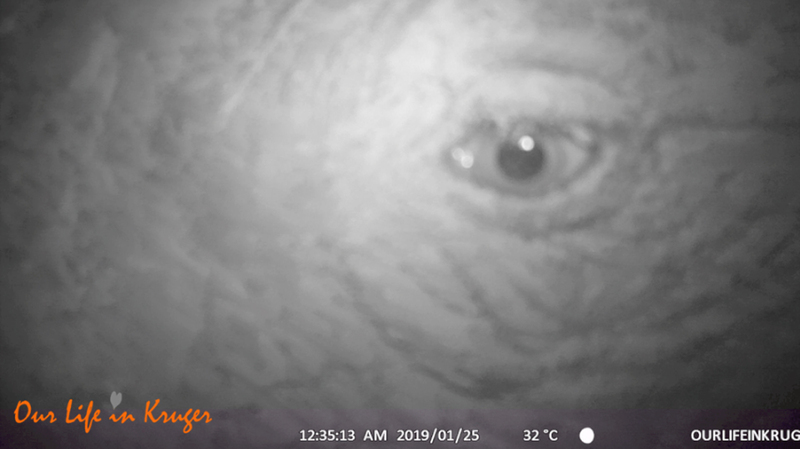 The trapcam, which was carefully placed at the wallow a few kilometers away, could have taken some spectacular footage, if only it had been there… You cannot have it al I guess, but we still got plenty! Three of the Big Five in fact! Have a look and please bear with me: I saved the absolute best till the end. Isn’t that just awesome? I love how some of the animals come up to the camera and stick their noses right up to smell it. My jaw dropped when I saw the footage of the big cat. Steven was standing behind me while I was going through the photos and videos. When I looked back at him, he just had a huge smile on his face. One thing I learned this last week is that the camera is quite sensitive to movement. The night before Steven left, I had the Trailcam set up in an open area. When I retrieved it the next morning, I had a whole memory card full of photos and videos of grass waving in the wind. Steven had a bit of the same during his trail. But luckily I sent a 16 GB memory card with him, so we didn’t run out of space. But I will have to play around with the sensitivity settings a little bit to try and avoid just getting grass in the future. Another thing I want to experiment with is the placement of the camera. I usually place it quite low to the ground, hoping to catch a porcupine, an Aardvark of even a Pangolin (I think I would just die on the spot if that showed up on the camera). But as you can see in the video below, animals are very curious about the funny looking green box on the tree and they sniff the camera, bump it or even rub up to it. Which produces some great footage, but might not be too great for the extended lifespan of my Trailcam! So I might try to put it a bit higher and angle it down. And see if we still get interesting footage of the Big Five, or other nocturnal creatures. I will report back with my findings! Have a lovely week everyone! That is so amazing to see! It feels as if I am there with them! Our best footage yet, I think! Wow Wow Wow. Jy het regtig mooi diere op die kamera gekry die week. I know, right? Was very exciting to go through the footage when Steven came home! Theuns, dit was fantasties! Steven het n goeie job gedoen! Lovely! Takes me there, thank you! Glad you enjoyed my post, Tami! Lovely! Takes me there. Thank you for sharing. This is so awesome!! I can’t wait to see what else you will capture on the Trailcam. Thank you so much for sharing with us. Love Kruger Park! Thank you for sharing. Absolutely beautiful. Look forward to seeing more. Absolutely stunning. thank you yet again. AWESOME Footage! Loving this new Blog as much as your other one. Thank you Linda and Steven. Cannot wait to be in the Park at the end of March. Thx Linda, that is awesome. What stunning sightings the trail cam produced! It really did! Steven found a fantastic spot! That must have been so exciting to watch for the first time. I can qyite see why you say it is a bit like unwrapping a christmas parcel – that huge sense of expectation and thrill. . . . Absolutely! Especially because fro the look on Steven’s face when he handed me the camera, I could tell there was some brilliant stuff on there! Amazing video. Made my day. So interesting to see the animals coming up close to the cam and eyeing it out. Leopard at the end was fantastic. Was that a cheetah calling, sounded like it. So glad you are doing this and sharing, have to say I live for my Kruger updates. Look forward to the next one. These lovely videos keep us going for a few more months until we can be back in Kruger. Thanks so much for sharing. Thank you for sharing this….WOW what a treasure chest of sightings. Thank you for the posts, we LOVE Africa, have been 5 times, would come tomorrow if our health hadn’t deteriorated. Thank you for NOT POSTING the location of the rhinos!!! I’m soooo upset with all the poaching happening in Africa…hopefully someone in power will do SOMETHING to stop all! Wonderful Linda! Just love this blog. I also loved going through all the footage, Sharlene! So lovely to watch the animals behaviour when we are not around!